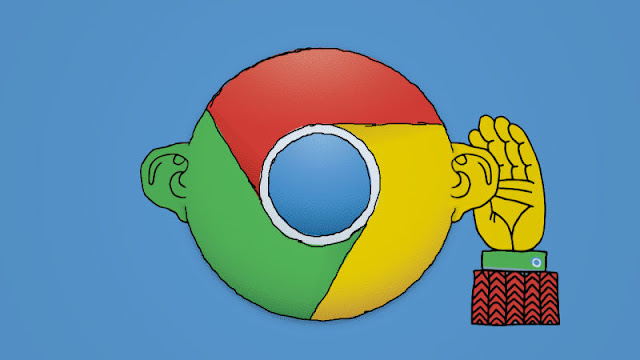 Home / Unlabelled / Privacy at Risk - Google is listening to you. After a number of posts regarding online privacy, Trojans, Malwares, Spywares today internet of thins have become Internet of Spy. Number of attacks are ready to exploit you and what if sites like google. today everyone is used to google. for any information the best option anyone has is google. But What if Google if Listening To You? As I always say its 2016, and our smartphones are misbehaving each and every second. Malwares are really bad enough, problems with device chip-set can be easily solved, you surely would have a PIN set to your smart phones. But do have you ever thought these all security concerns are just the shadow to the real privacy scandal taking place right now. The device you carry in your pocket, hold in your hand or that's placed on your desk is the tool to spy on you. Yes you read it right its not for your benefit its for the benefit of Bad asses who are so called trust worthy in today's world. Why? How and what has Google got to do with it ? Early in 2016, it became apparent that either a massive coincidence was taking place across the planet or smartphones were listening into conversations for keywords and serving contextual adverts. At this point, it was only possible to get similar results from Google and Facebook, but as we looked further into this, we found that several other services were also listening in. Thanks to our readers, it was possible to gauge an idea of just how widespread the issue was, and to rule out the possibility of a mere coincidence. When this possibility was first posited, it seemed unlikely — that is, until cybersecurity researcher Ken Munro and Pen Test Partners’ David Lodge got together to develop an app. With the aim of recording nearby conversations and displaying them on a PC, the app was a working proof to the fact. All we did was use the existing functionality of Google Android — we chose it because it was a little easier for us to develop in. All it took was the Android device microphone and some system permissions. So, we know it’s possible, and that people have noticed some very strange behavior from adverts on their smartphones. But is there any proof that audio is being recorded? Well, yes there is. Quite a bit of it, in fact. 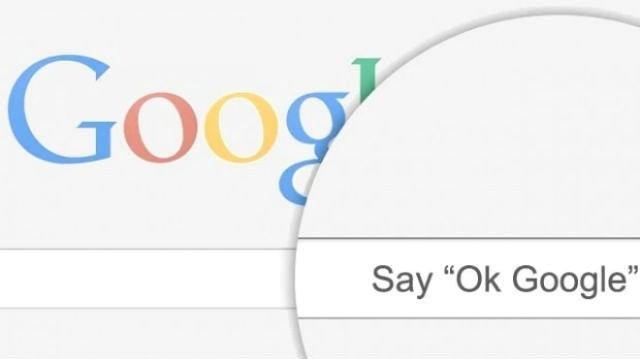 Ostensibly to improve voice recognition, the OK Google service records every instruction and search query you make using the “OK Google” command. Rather than just react to the captured audio, the data is stored. 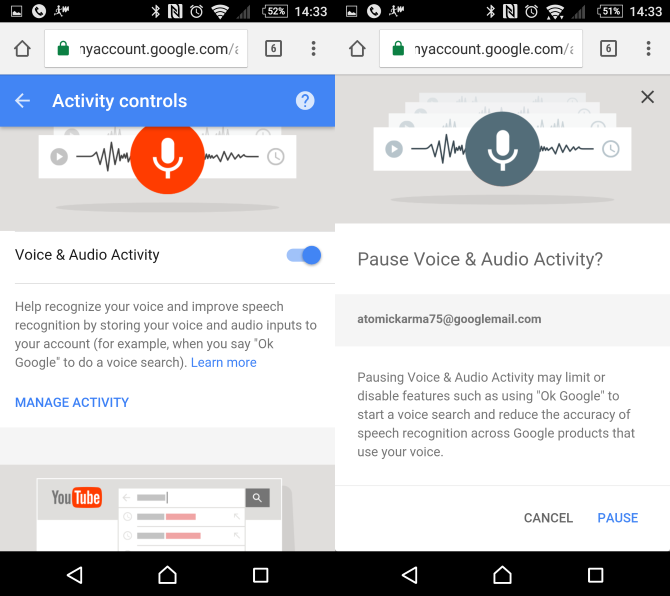 If you’ve used OK Google, you probably thought that the audio was observed by the app, which then reacted to it. You probably didn’t even realize it wasn’t being discarded, because you had zero awareness that it was being recorded. 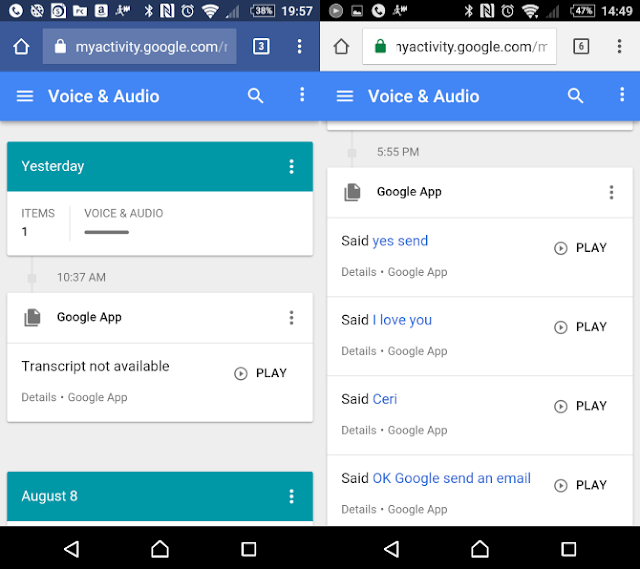 These recorded clips seem to be a combination of OK Google commands and completely random soundbites, the audio for which is all stored on a central Google server. Once you’ve digested that chilling fact, it’s time to check the recordings. The best way to do this is to visit history.google.com/history/audio on your phone or in your desktop browser, and take a look at the long list of items that have been recorded. My list is particularly baffling, as it combines OK Google commands with random snippets. Google attempts to transcribe everything, with occasionally hilarious results. Disabling these recordings seems to be the best option. While they might be largely nonsense, the fact that they can be recorded apparently without your knowledge, at any time, is of huge concern. Tying this back to the unease over Google and Facebook potentially eavesdropping for keywords, switching off the feature makes sense. To do this, go to history.google.com/history/audio and open the right-side menu, selecting Activity controls. From here, scroll down until you find Voice & Audio Activity and tap the switch to Pause. Google may also continue to collect and store audio data in an anonymized way. At this stage, if you want to discard the existing recordings, you should do so — whether they’re nonsense or not! Tap the Manage Activity link, then open the right-hand menu and choose Select. From here, tap each check box then the trashcan button at the top-right. Again, Google will inquire as to whether this is genuinely a decision you want to make, and present you with some reasons to keep the recordings. Simply proceed through this notice and confirm the deletion to rid yourself of the recordings. 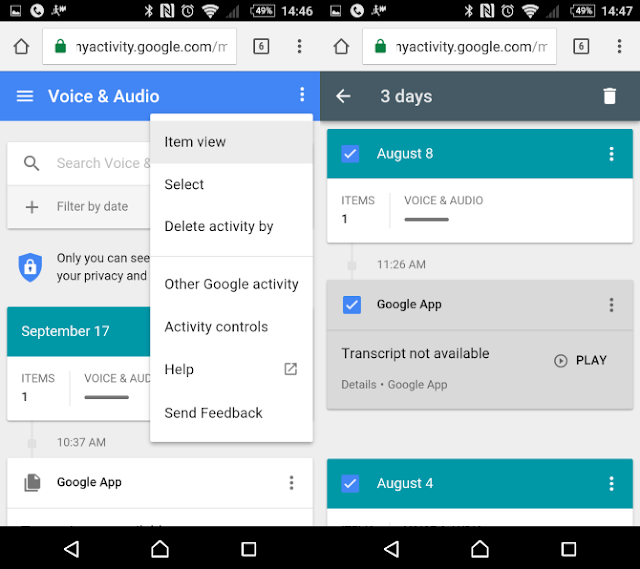 One last thing to note here: make sure you disable recording and delete activity for ALL of your Google accounts. When you started using OK Google, you probably didn’t expect your voice to be recorded — certainly not in a way that could be retrieved later. There really seems little reason for Google to retain this data. Voice recognition technology is impressive. It’s useful, and it can add an element of safety in hands-free scenarios. But does it really have to be invasive? Do these recordings have any connection to accusations that advertisers are eavesdropping via our smartphones? What do you think? Did you find any unusual or concerning recordings in your own history? Tell us in the comments.